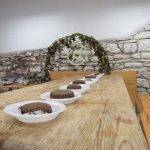 Yesterday finished the 43rd Race of the ring, a three day manifestation which was traditionally attended by a many residents of Barban, but also by large number of guests from Croatia and abroad. 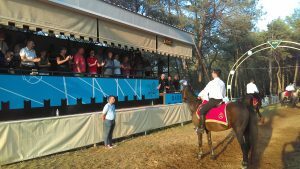 The winner of this year’s Race is Kristijan Kancelar on the horse ‘Ramses’ with 9 points, the maximum number that a horseman can score. He had won one ‘Race of the ring’ until now, ten years ago the 33rd Race of the ring. In this context we should also mention the debutant Bruno Celija, who on the horse ‘Gema’ won the saturday’s 23rd ‘Vitica’ Race. On Barban’s main square, or ‘Placa’ at saturday there was a concert of the famous croatian singer Lidija Bačić, and yesterday at the same place Group Vigor entertained the gathered public. Caffe Bar Roy established itself as a good place for parties with a three day party that included various DJ’s and bends. All three days were also traditionally rich with other various cultural and sport content, like for example tournirs in cards, football, an exhibition of paintings, 6th Robotrace of the ring by elementary school students, and also of course fireworks on the final day. We would like to express gratitude towards all who supported this manifestation in any way possible. See you all next year also the third weekend in August! Greetings from Barban! 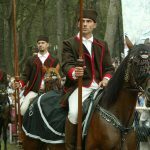 The winner of the 23rd ‘Vitica’ Race Bruno Celija on the horse ‘Gema’.